El-Solo is a brand name of Maa Bhawani Leather Art & Craft. We are the well established manufacturer, Supplier, Exporter of the Handmade Natural & Finished Leather Bags, was established in the year 2002 in Jodhpur, Rajasthan, India. We are the manufacturer and in our factory, we have a team of dedicated and skilled local artisans who have specialized themselves in creating fine leather articles from the years, they got the art and expertness from their forefathers doing the same things from decades. After creating a buzz and stronghold in the domestic market, the young and zealous entrepreneur, Deepesh Singhal in the year 2013 planned to showcase these acclaimed leather creations and handmade products at a global platform. After studying rigorously the global trends and understanding the buyers’ requirement eachcountry to country, we have stepped into the global arena. Our sole goal is to deliver the best quality handmade Products at an unbelievably affordable price so that our customer always remains happy and satisfied with us. In spite, we want to help our artisans in best possible manner, we want to help the poor artisans and we take responsibility for education for children of several artisans and make their life better. In our creative workshop, we have something for everyone. 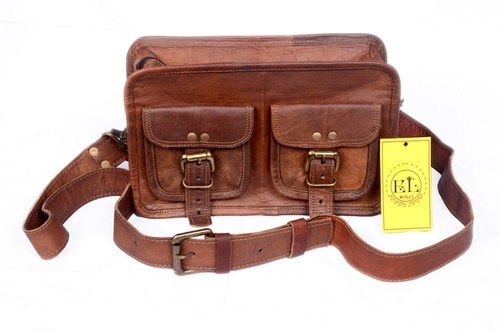 We offer a wide range of handmade natural leather & finished leather bags that includes messenger, laptop, office , school, professional , backpacks , ladies stylish bags , Dslr Camera Bags, Duffel And Travel Bags, cash & conductor bags, tablet bags , sling & satchel bags. Elsolo leather bags are of genuine leather whether they are In goat leather or finished leather. Goat leather bags are made with genuine vegetable tanned leather and no chemical treatment is given. They are 100% natural and eco-friendly bags. Our bags are perfect in size as given for every bag. Although all the bags are handmade but they are very perfect in stitching and finishing. Our major buyers are in the USA, Canada, UK, France, Italy, Germany, Netherlands and Australia. How should you reach out to us? If you like to have bulk orders for us or you want some customised design as per your requirement, we would be happy to deliver the finest quality product in cost effective manner within Deadline Given to us. We Invite Wholesale Buyers for the wholesale deals as well as individuals for their customized designs or for any other queries related deals and shipping, Please reach out to us at mblac2000@gmail.com or on +91-9413487773 (Call and Whatsapp customer service number) and we would be at your service.